Punch and Judy are the most famous puppets of all time and are loved and enjoyed by everyone, young and old. The slapstick comedy and characters make this one of the most enjoyable types of entertainment. 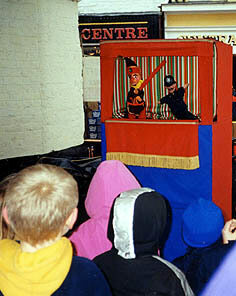 Punch and Judy is a popular entertainment for children at birthday parties, garden parties, schools, fetes and shopping centres. The children will laugh, scream and shout at all the antics that go on during the show and the adults have a good laugh too.